Via-Chem is a division of Fort International, which was established in 1974. Via-Chem has become a leading supplier of a wide range of retail and industrial adhesives, professional nail care products, as well as adhesive backed decorative hooks, Super Klips, wire, cable and cord management products. Our retail adhesive products are made up of almost 100 different glues, clips and hooks, allowing us to provide our customers with unique and customized planogram programs to fit their specific requirements. Our retail adhesive categories include super glues, epoxies, contact cements, stationary and wood glues. We are proud to supply some of North America’s largest retailers with the Via-Bond adhesive brand, as well as, very comprehensive private label programs. The Via-Bond brand has been a trusted product line to customers for many decades, it’s a name people rely on when it comes to glues, specialty adhesives, hooks, clips and related products. Another successful program we offer our customers is our private label programs. We can customize our product lines with your ‘house’ brand on it or our marketing team can create an exclusive brand for you. It is from this experience in the professional nail care market that the Rendez-Vous (RV) brand evolved. The RV Nails business offers our customers several different options, as they can choose from the RV Nails branded line of products, a full line of bulk supplied products (ie. no brand, bulk packaging) or a customized private label program. RV Nails is a sub-division of Via –Chem that supplies close to 50 different professional grade nail enhancement products to the nail care trade. We offer gel polishes, acrylic powders, EMA monomer liquids, nail adhesive, top coats, base coats, preps and bonds. 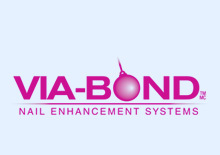 The Via-Chem industrial adhesive division supplies the professional/industrial markets with professional grade cyanoacrylates (super glues), epoxies, thread lockers and related accessories under the Via Bond brand, as well as, private label programs. We are pleased to supply our adhesive backed decorative hooks and Super Klip fasteners to a variety of industrial and B2B customers. Within this professional division of Via-Chem we also have our much sought after professional grade brush-on super glues which has been used by the professional nail care industry for over 25 years. To learn more about our products and services please click to open any of the sections below and select the PDF file of interest or feel free to contact us directly at anytime.